Project Indect: I like 'security of citizens'. Not so thrilled with 'observation, searching, and detection'. Excuse me a second while I put on my tinfoil hat and my super absorbent conspiracy pants. In a controversial move, the European Union has given £ 10 million in funding to Project Indect, a wide ranging five year plan to bring passive and active monitoring to almost every aspect of public life in the EU. Hardware and software platforms to monitor public spaces for ‘abnormal behavior’, special search engines for images and documents using ubiquitous hidden digital watermarks, and internet based intelligence gathering that will monitor public networking communities – if you’ve had a nightmare about government invasion of privacy, chances are that Project Indect is trying to make it come true. Yet, as scary as the project may appear, and despite my shiny tinfoil headgear, I don’t find the prospects of this Orwellian endeavor that surprising. We’ve seen cameras getting smaller, CCTV spreading through the UK, and even projects aiming to incorporate brain scans into security checks. New software platforms like Vitamin D Video are geared at making such technologies more powerful by helping users sort and filter vast information efficiently. The Iraq War has lead to an increase dependence on automated surveillance and response to help combat the increased frequency of surprise attacks, explosive sabotage, and modern guerilla tactics. Project Indect should be seen as part of a larger trend to leverage technology to combat the security threat of the 21st century: dedicated combatants using dispersed violence for an united goal (aka Terrorism). 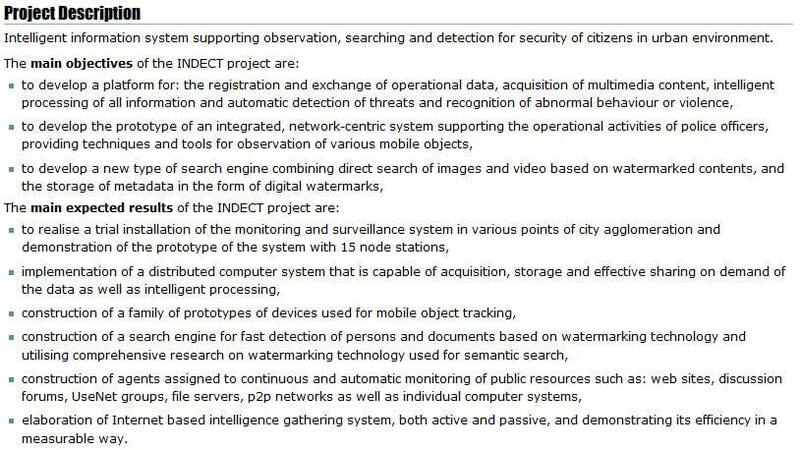 *screen capture from Project Indect website. As I said above, we’ve seen most of these ideas and technologies before, though not in one umbrella project. The first objective, the platform to detect abnormal behavior or violence is just like the Humabio project we’ve discussed. Network of detection devices? Just like the CCTV cameras in the UK. The US Department of Homeland Security has already set similar goals for the improved exchange of information between diverse law enforcement agencies. Mobile object tracking sounds similar to Vitamin D Video. Of course, some of the goals have been less well publicized in previous incarnations. Special search engines to track images based on digital watermark metadata, trolling the Internet to gather intelligence, and the continuous monitoring of online networks…these ideas aren’t new, and you can bet that most countries have been pursuing them in one form or another. Certainly China has a rigorous set of monitors placed on its citizens’ internet use. To accomplish online observation at the continental/global level as the EU suggests will require an advanced approach to sifting through vast amounts of recorded information. Fortunately or unfortunately, that technology is already under development. The level to which the average citizen will be monitored under Project Indect is certainly frightening. Start acting funny in an EU airport, use the word ‘bomb’ too often on a message board, or commit a petty crime (thus having your DNA and photo placed on file) and you’re bound to be monitored. Opposition to the project focuses on how average, innocent, civilians will be under automatic and unwanted surveillance. Of course, people seem to forget that they already are. Use a search engine, walk near a bank, or purchase a magazine subscription and you’re going to be monitored. Private companies are data mining your online behavior, recording your actions near their property, and purchasing your marketable information every day. Where does all your junk mail come from? Why does my Yahoo search for ‘great holiday vacations’ yield a different result than your search? The truth is that the social concept of privacy is already decades out of date. Don’t get me wrong, the notion that centralized governments will monitor their citizen’s daily lives is important and scary. Yet the new development is not that Europeans will lose privacy, but that they will lose privacy to groups that are ostensibly trying to curb violence. Right now, you cede your privacy largely to groups trying to sell you something. When Google tracks my web browsing, it gives me new ads, when Project Indect does it, it could mean police coming to my house. Of course, it could also mean that there are less bombs placed on trains, quicker responses to fights in taverns, and that recovering a stolen bike would no longer be a virtual impossibility. I don’t know whether Project Indect will meet with success or be defeated by public outrage. I do know that even if this current form of mass-scale surveillance fails, it will be replaced by another. The technology to track human lives is simply too cheap, too easy, and too profitable not to be used by someone. Unless we see a surge in technology designed to defeat such observation we will likely have to come to terms with a new concept of ‘privacy’. Ok, I’m taking my tinfoil hat off, but the pants stay on. This stuff scares the…out of me.